Brown leaf tips on house plants can be caused by chemicals in tap water, over- or under-watering, pests, dry air, or excessive fertilizer. 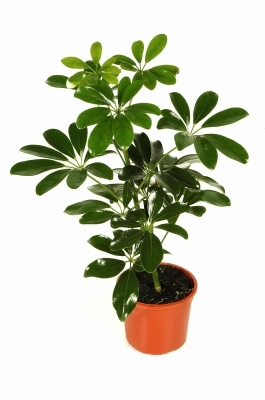 The most common cause of tip burn on house plants is the use of tap water. Tap water is different from the well water that most large-scale growers use, because it has been treated with fluoride and chlorine. These chemicals can build up in house plant leaves, causing a chemical burn on the leaf tips of certain plants. Ti plants, Spathiphyllum, and Spider Plants are particularly likely to be affected. Solution: Fill a container with tap water and then leave it overnight to allow the chemicals to dissipate before watering the plants. Brown tips on leaves may also develop as a result of either too much or too little water. Too much water can lead to root rot, which prevents water from reaching the leaves. Too little causes plants to dry out. Solution: Plant pots should have holes for drainage to help prevent root rot, and a plant moisture meter can be useful in determining how much water a plant requires at any given time. Using water stakes, which release water into the soil as required, is also a good way to regulate soil moisture. Moisture meters and water stakes are available in many attractive designs, with some made to look like animals or blown glass art pieces. There are a variety of insects that attack house plants. Pest infestation can cause brown tips on plants in some cases. Plants that naturally grow in areas of high humidity can have difficulty in dry climates, and overwatering will make the problem worse as it can cause root rot, which means even less water will reach the plant’s leaves. Solution: In the case of dry air caused by climate or winter heating, using a humidifier can solve the problem. Misting plants with a spray bottle will not work, unless it is done every 10 minutes. Another strategy is to place gravel in the saucers underneath house plants and keep the saucers filled with water, with the water line stopping just below the base of the pot to prevent roots from becoming waterlogged. A fine gravel should be used, as this will have more surface area for evaporation. Fine aquarium gravel can be purchased at most pet stores. The water in the saucer will continually evaporate, releasing moisture into the air around the plant. Plant location can make a difference as well. Plants should be clustered together, if possible, as they will lose less moisture this way. They should also be placed as far away from hot air vents as possible, and in hot, dry climates should live in the coolest rooms of the house. Keeping plants in bathrooms and kitchens can also help, because moisture from showers and cooking creates a more humid atmosphere. The excess salt from too much fertilizer can cause tip burn on leaves. Solution: If there is a salt accumulation, the soil must be flushed out with repeated applications of large amounts of water. For information on garden pests and homemade pesticide recipes, see Natural Garden Pest Control. For a full list of garden and plant articles, visit the main Gardening page. Ash, Cynthia L., Diagnostician, Askew, Robert G., Extension Horticulturalist, & Kopp, Dennis D., Extension Horticulturalist. (December 2009). “House Plants: Proper Care and Problem Solving.” County Commissions, North Dakota State University and U.S. Department of Agriculture. Ag.ndsu.edu. Begeman, John, College of Agriculture and Life Sciences, The University of Arizona. (13 December 1998). “Brown Tips on Houseplant Leaves.” Arizona Daily Star. PlantCare.com. (n.d.). “Brown Tips on House Plants – A Reason Why!” PlantCare.com. The Garden Helper. (22 February 1999). “Insects, Bugs, and Pests That Invade Your Houseplants and Flowers.” TheGardenHelper.com. This told me nothing. Vague answer saying only either over or under-watering does the same thing Still no definitive answer to why my plants turn brown. Waste of time. No answers here.